Our newsletter is printed and distributed three times a year (February, June, and October). 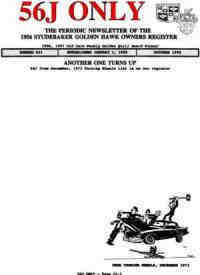 Several of the most recent issues have been converted and uploaded to this site. Members are free to place ads, offer assistance, ask questions, and share their experience with these cars. The newsletter is titled 56J ONLY. Though meaningless to the casual observer, the newsletter name is quite significant to the 1956 Golden Hawk Owner. The first part is taken from the year of the car (56) and the engine designation (J). The second part (ONLY) is in response to a phrase that has become quite annoying to the owners of these cars. Though the car is a Studebaker, the engine is a 352 CID V8 built by Packard and was not used in any other Studebaker. Whenever Studebaker vendors advertise V8 engine parts for Studebakers, they always include the phrase "EXCEPT 56J, or EXCEPT 56 GH". This same phrase appears in the various parts catalogs also. Now, we have a club and a publication dedicated to just the one year, make and model and it is appropriately called 56J ONLY. The1956 Golden Hawk Restorers Guide Video and the 1956 GH Parts Catalog, 1956 GH Authenticity Guide, 1956 GH Production Orders, 1956 GH 56J ONLY Newsletters, 1956 GH Production Orders, 1956 Passenger Car Owners Manual, 1956 Accessories Catalog, 1956-57 Shop Manual, 1958 Shop Manual Supplement, 1953-58 Body Parts Catalog, 1955-58 Chassis Parts Catalog, and Borg-Warner Overdrive Manual, All in PDF format, view -able with Adobe Acrobat Reader. 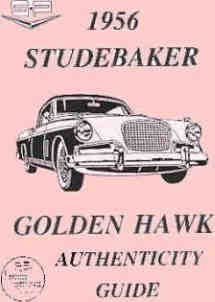 1956 STUDEBAKER GOLDEN HAWK AUTHENTICITY GUIDE. 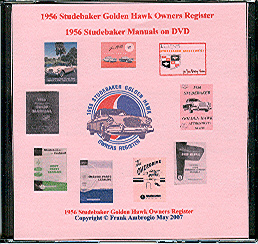 International Shipments International Shipping for 1956 STUDEBAKER GOLDEN HAWK AUTHENTICITY GUIDE. 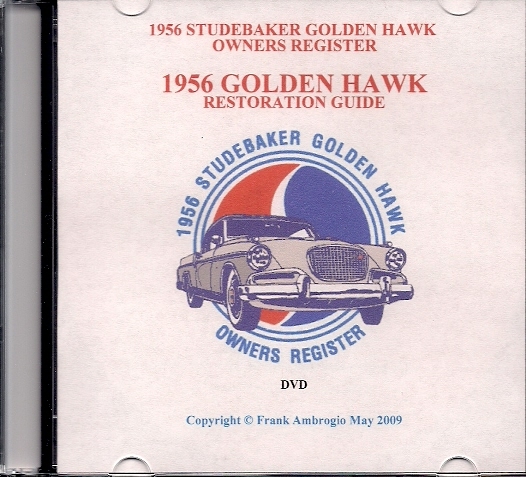 DVD - 1956 STUDEBAKER GOLDEN HAWK RESTORERS GUIDE. Basically, this is a video version of the Authenticity Guide above with a lot of added material. The DVD shows a detailed video of the entire car except for the undercarriage. Helpful for anyone restoring 1956 Golden Hawk, or for anyone thinking of purchasing one. You can play this DVD on the DVD drive in your home computer, portable DVD player, or on the DVD attached to your TV $20.00 (includes postage). The 1956 GH Parts Catalog, 1956 GH Authenticity Guide, 1956 GH Production Orders, 1956 GH 56J ONLY Newsletters, 1956 Car Owners Manual, 1956 Accessories Catalog, 1956-57 Shop Manual, 1958 Shop Manual Supplement, 1953-58 Body Parts Catalog, 1955-58 Chassis Parts Catalog, and the Warner Overdrive Manual, PDF format, view-able with Adobe Acrobat Reader (included). $20.00 (includes postage). This disc is the same as the Flash Drive but without the Restorers Guide Video. red, attaches to the wire from the sending unit to the tachometer. $ 3.00 (includes postage). red with black lettering (attaches to one of the generator terminals $ 1.50 (includes postage).